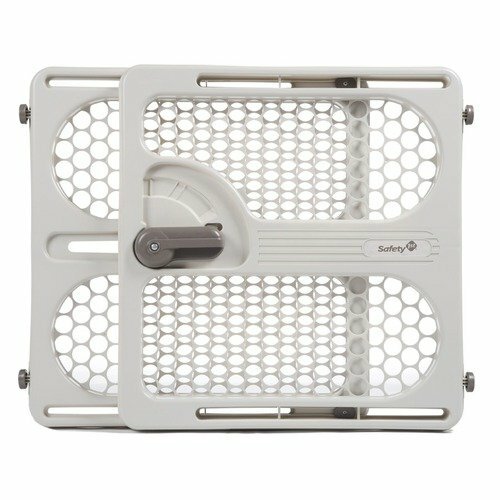 I purchased two of the Safety 1st Easy-Fit Security Gates ($19.99) from Diapers.com, specifically to use for my kitchen and my Mom’s hallway door. My daughter crawls all over the place now, and will follow me any and everywhere. She knows how to pull open cabinets as well, so it was time for me to start baby proofing the house. I love how easy it is to put the gate up! Simply extend the gate to the width of the entrance area and then press down the lock lever to tighten the gate and it will hold in place! The gate needs no hardware and uses pressure mounting to create a sturdy barrier. The gate is 27″ tall and can expand to fit from 28″ up to 42″. Right now, when my daughter stands up to it, I can see the top of her head. It’s too cute! She holds her face against it, or she tries to play peek-a-boo while I’m in the kitchen washing dishes or cooking.